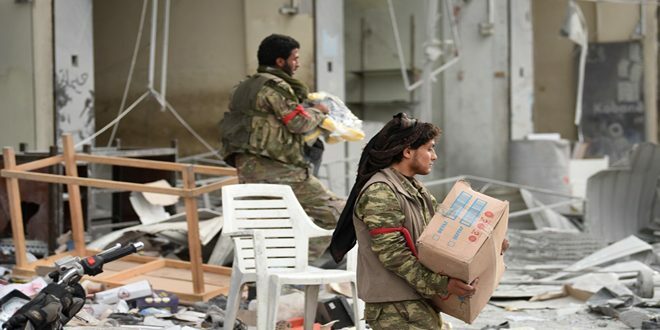 A year ago, forces of the Turkish regime and its mercenaries of terrorist groups swept into Afrin City after three months of systematic airstrikes and. bombardments with different types of weapons on the city’s neighborhoods and tens of the nearby villages and towns paving the way for thousands of terrorists to attack civilians and usurp their properties and land. The hugeness of the attack on Afrin, northern Aleppo, and its nature and timing shows the extent of the setback which Erdogan’s regime suffered in the area after the strategic victory which was represented in liberating Aleppo city from terrorism and the successful battels which followed it as wide areas in the countryside of Aleppo, Hama and Idleb have been liberated. The invasion of Afrin city by the forces of the Turkish regime was on March 18th 2018 after a heavy shelling which lasted for several days and caused a huge damage to Afrin Hospital and claimed the lives of scores of civilians and injured others, mostly women and children. A year after storming into the city, local sources affirm the hugeness of the catastrophe from which the civilians which are still inside the city and the surrounding villages and towns are suffering. More than 50 terrorist organizations, most of them adopt the mentality and ideology of al-Qaeda terrorist organization, spread across the city as abducting civilians has become very frequent, in addition to robbing properties, looting houses and displacing the locals by means of force and threat. The scene of aggression on the area of Afrin brings to mind what the Zionist enemy had done in the liberated city of Quneitra as Zionists wreaked havoc across the city destroying all the churches, mosques, houses, hospitals and all facilities in it. The massacres committed by the Turkish regime and its mercenaries of terrorists come in framework of the hostile close-minded policy which is based on the black Takfiri mentality that serves the agendas of the new Ottoman regime which aims at expanding its control and imposing the policy of fait accompli on the independent states which are engaged in a relentless war on terrorism. Launching aggression and breaching the international laws and conventions and ignoring them has become very normal to the Turkish regime whose limitless support to terrorist organizations has become very clear. Erdogan’s regime has intentionally destroyed archeological and historical sites in the area such as the archeological site of Brad which embraces St. Maron’s tomb in northern Aleppo, which has been on the UNESCO World Archeological List since 2011. The mercenaries of the Turkish regime which are represented in the terrorist groups have committed tens of crimes against civilians as sources affirmed that terrorist groups last February uprooted about 1050 trees of olive, cheery and almond in the town of Qurna to the north of Afrin city and they were transported to the Turkish territories. The terrorist groups have also set fire in many areas as more than 20 thousand fruit trees and tens of hectares of coniferous forests and bushes have been burnt under the pretext of opening the roads that link Afrin area with the usurped Liwa Iskenderun through the village of Hamam, 25 km west of the city, to allow the passage of trucks carrying olive and other materials from Syria which represents a robbery of the Syrian national resources and properties in the broad daylight. In framework of the cunning schemes of their sponsors in Ankara and in an attempt to obliterate the cultural identity of the area, terrorists directed and led by Turkish, American and French archeologists have carried out excavations at the archeological sites and they have stolen many unearthed archeological finds. The Syrian Foreign and Expatriates Ministry had condemned the excavations at the archeological sites and stealing many archeological finds in Afrin, Manbij, Idleb, Hasaka, Raqqa and other areas by the US, French and Turkish forces and their terrorist agents, considering these acts of excavations and looting and stealing the Syrian cultural heritage and destroying it as a new war crime added to the crimes committed against the Syrian people and their history and culture. The relation between Erdogan’s regime and the Takfiri mentality has been ideologically framed and it is uncovered by the facts on the ground which show the extent of its cooperation with terrorists through its attempts to increase the logistic support and to ensure the arrival of more terrorists through the Turkish territories to northern Syria in order to prolong the hostile war against Syria which is fighting terrorism on behalf of the whole world. Identical medial and local sources confirmed that the past few months have witnessed a notable increase in the number of “al-Qaeda” terrorists who arrived in Idleb via the Turkish territories passing through the two border towns of Atma and Sarmada to join the faction of the so-called “Hurras Eddin” affiliated to “Qaeda” which is on the International Terrorism List in a new breach of the demilitarized zone agreement. The final word in the response to the aggression and for clearing every inch of the country’s soil from terrorism and ending the illegal presence of foreign forces will be for the Syrian Arab Army as the defeat of terrorist organizations will break the projects of their backers and sponsors of regimes and countries that committed the worst crime in the current age through waging a terrorist war against the Syrians and their country directly or indirectly.